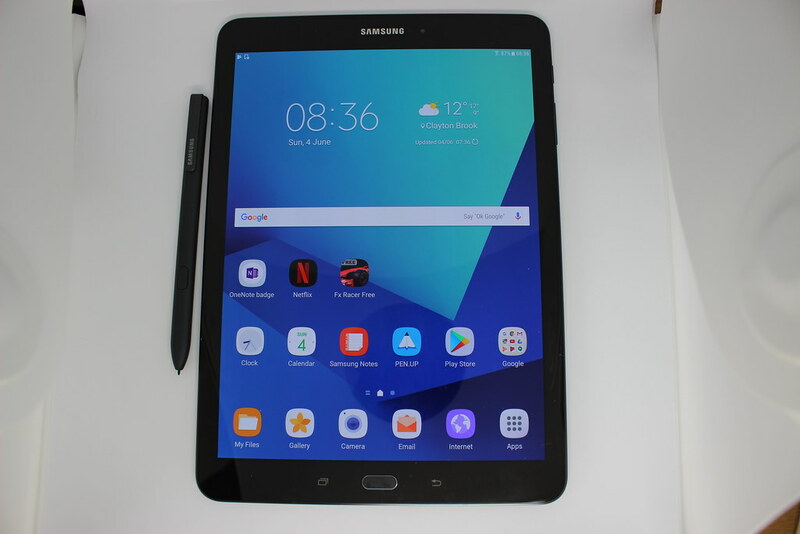 Is the Samsung Galaxy Tab S3 the best 10 inch tablet on the market? The tablet certainly feels like a premium devices. It’s only 6mm thick and weighs only 429 grams. It has a glass back and curved edges and feels great really good in the hand, the back does attract finger marks so you are going to want a good cleaning cloth. On the front there are capacitive task switcher and back buttons and a home button which is also fingerprint reader. The finger print reader works well, it’s a good way to wake the tablet and makes having a long password less of an issue and much more secure than a simple pin. 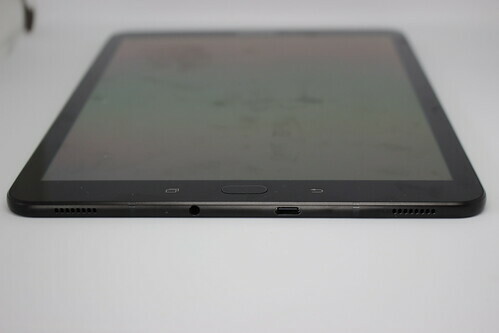 The 9.7 inch super AMOLED screen is very bright and has very impressive colour reproduction. The resolution runs at 2048 x 1536 and the display is looks very sharp and clear, it’s great for watching videos on or viewing pictures. The colours reproduction is very good, the blacks are back and the colours really stand out. The screen is glossy and reflective but I took it outside in a rare moment of sunshine in Manchester and the screen was perfectly usable probably because of the good level of brightness. The tablet is very responsive and fast. It can handle running multiple apps at once and there are no slowdown opening up apps. You can run in split screen mode and have two apps on screen at once, which is something I would do all the time on a Windows tablet. With 4GB of RAM you can run multiple large apps at once, I tend to use Onenote and Chrome in a split window and there are no slowdowns. I found the battery life is around 11 hours of continual use, browsing and listening to music. There is a 6000 mAh battery and Samsung say you should get around 12 hours. Charging is very quick via the USB C port and USB C charger which takes just under two hours to charge from flat. The tablet comes with a new S Pen which you can use for navigation and for taking notes or drawing. There is a pen hover mode that gives you quick access to short cuts like the note taking app which you can customise (I added OneNote). 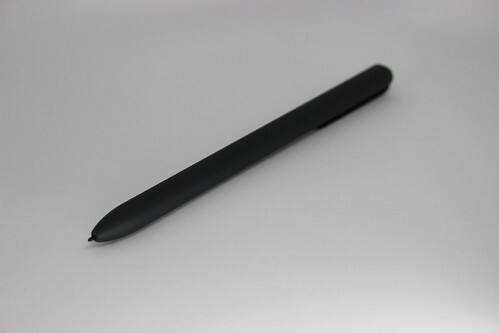 The pen supports pressure sensitivity and works very well with apps like Microsoft OneNote, the only minor issue I have with the pen is there nowhere to put it when not in use, I miss the magnetic attachment feature of the Surface Pro 4. I have to say the pen is well designed and not bulky. The speakers have a good volume range and are very clear, Samsung say they are “tuned by AKG”. There are speaker grills on the top and bottom of the tablet and you get separation of left and right channels. There is a rear facing 13MP camera and a 5MP front facing camera. I am not a fan of using a tablet as a camera but the rear camera is a good for taking pictures and the front is good for things like Skype video chats. There is even a selfie mode that you trigger by holding your hand up, not something I will be using but some people will. There is a USB C port for fast charging and also for plugging in devices like a keyboard and mouse. I plugged a USB Hub (this one) into the tablet and then a USB keyboard and mouse which worked fine without installing any apps or drivers. There is also a 3.5mm headphone port. There is Bluetooth 4.2 support and 802.11 a/b/g/n/ac Wi-Fi built in. You can expand the storage via a MicroSD card (up to 256GB). It’s been a while since I used Samsung’s version of Android and after using Android 7.1 on a Nexus 6P for a while I wasn’t expecting to like Samsung’s Android OS. However I was pleasantly surprised how close to stock the version of Android is and in some case is an improvement over standard Android. One of the great things about running Android is the available apps, the Google Play Store has millions of apps but not all of them are optimised for tablet use, some like OneNote scale up very well and make good use of the screen real estate where as many other are just the standard phone apps. I come from a Windows background and find Android great for consuming content but not as good for creating it and also multi-tasking and multi-window support is just not as well developed as Windows 10 and even iOS feels more polished in that respect. The Samsung Galaxy Tab 3 is an impressive tablet with a premium design, great screen and handy features like the finger print reader and pen. It has plenty of power and good battery life and is great for watching movies, browsing the web and catching up on your email. I have been using it in meetings taking notes with OneNote and it very good in that situation. You can get a keyboard for the tablet to kind of turn it into a laptop but it is not really a laptop replacement. 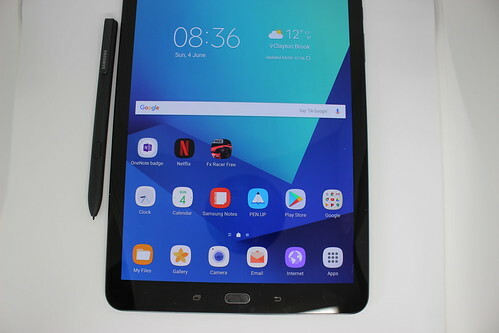 At nearly £600 it is not cheap device and it certainly feels like a premium device, for that price you can get a good convertible Windows tablet/laptop or an iPad so you should consider which operating system is best for you when selecting a tablet. If you use an Android phone and want the bigger screen along with a pen then this is a great choice especially if you use a Samsung phone. Previous The Digital Lifestyle Show #605 – Red or Green Button?